2.0 music launch: The audio launch of Shankar’s 2.0 was held at a grand event in Dubai on Friday. AR Rahman has composed the music for the Rajinikanth-starrer and he also performed the songs live at the event. Madhan Karky has penned the lyrics. 2.0 also features Akshay Kumar and Amy Jackson. 2.0 features Rajinikanth, Akshay Kumar and Amy Jackson. Launched at a lavish event in Dubai, all the superlatives in the jukebox have to be brought to describe the buzz around 2.0 and by extension, its music. The album scored by Mozart of Madras AR Rahman has three songs of which two were launched on Friday. The film’s tagline is that the world is not just for the humans and the songs have been devised to accommodate film’s thematic choices. The first song “Endhira Logathu” beautifully depicts a love story between two robots. The slow, tech-heavy number has some charming verses by Madan Karky, who also gave us the amazing “Irumbile Oru Idhayam” from Enthiran. The lyricist is at his best, with some creative phases such as “Minsara Samsarame (An electronic wife) or “Engine ai alli konjariye” (You are sweet talking an engine) that clearly indicate a love story between the two robots namely Chitti (Rajinikanth) and Amy Jackson’s character. Oh, there is also a reference to Kanini Rajini (A robot Rajini) in case you needed more clues. Sung by known names from the Rahman stable, Sid Sriram, and Sashaa Tirupati, the song alternates between a groovy tempo to a more upbeat electronic pace. While it might sound unimpressive initially, the beats grow on you — something we call the Rahman phenomenon. Knowing Shankar, one can already imagine robots grooving to the beats in a breathtakingly visualised song. The second song “Raajali Nee Gaali” sounds surprisingly similar to the “Endhira Logathu” in terms of percussion. However, “Raajali” seems to be a victory anthem with more rustic sounds in the orchestration. A song that seems to describe the triumph of good over evil, Madan Karky’s lyrics are unabashedly casual but at the same time effective. The song begins with an interesting reference to Isaac Asimov, the celebrated science fiction writer, and ends with a reference to Ranguski, the pen name of celebrated novelist Sujatha. Notably, late Sujatha had co-written Enthiran with Shankar and is famous for his science fiction tales. Sung by Sid Sriram, Blaaze, and Arjun Chandy, the lyrics ooze ‘mass’. However, the song vaguely reminds us of “Arima Arima” from the prequel in its anthem-ish arrangement. While the songs or the sounds may not make sense in isolation, they seem to be in sync with the theme of the movie. The songs are out on Saavn. Listen them here. 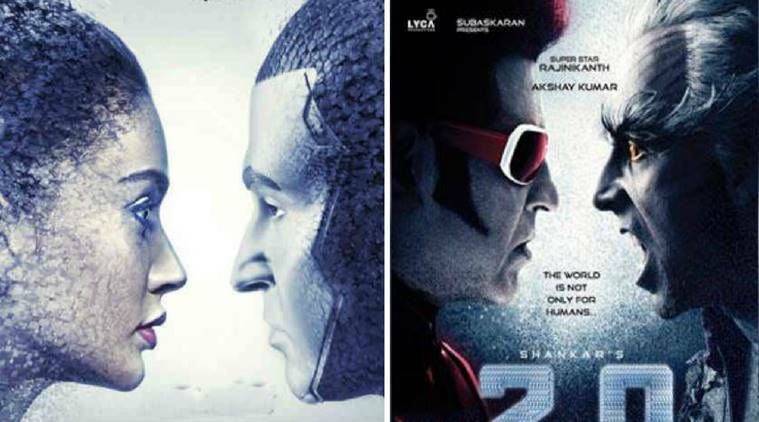 Featuring Rajinikanth, Akshay Kumar and Amy Jackson, 2.0 is one of the grandest projects in Indian cinema. The music was launched in a magnificent event in Dubai where the maestro performed the songs live with a 125 member symphony.